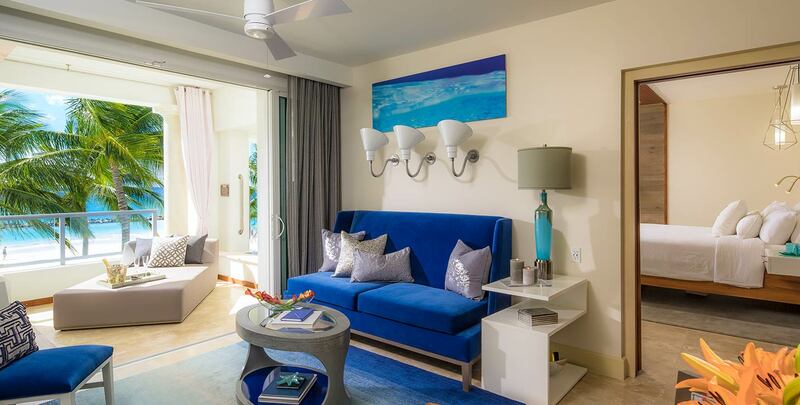 Experience the Royal Treatment at Sandals Royal Barbados, the all-new, all-suite resort in the spirited St. Lawrence Gap area. 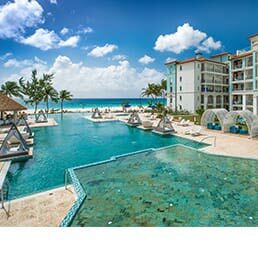 Featuring a number of Sandals firsts, including the first rooftop pool and bar, the first 4-lane bowling alley, Sandals first gourmet donut shop, and two new restaurant concepts – American Tavern and Chi Asian. This 272 all-suite resort features Sandals signature accommodations, including the magnificent Skypool Suites, Swim-up Suites, and Millionaire Suites, world-class international cuisine at seven restaurants, and a 15,000-sq.-ft. spa. Stunning ocean views, Butler Elite service and exclusive exchange privileges with nearby Sandals Barbados define the new Luxury Included® experience at Sandals Royal Barbados. Guests staying in top-tier suites receive exclusive Sandals Gold Star Arrival Service*, which includes expedited immigration, personal airport greeting, coordination of your Rolls-Royce transfer, and access to arrival lounge amenities. All other room categories enjoy non-stop, round-trip airport transfers in an air-conditioned vehicle. *The Sandals Gold Star Arrival Service in Barbados is provided by a 3rd party service. 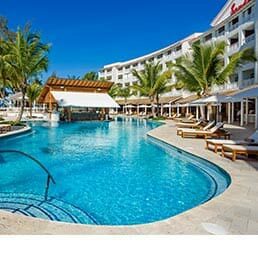 This all-suite resort features Sandals signature accommodations including Skypool Suites, Millionaire Suites and Swim-up Suites – all featuring Tranquility Soaking Tubs™ for two. Sandals Royal Barbados is set along the white sands of Maxwell Beach–one of the islands most unspoiled beaches–you’ll find mesmerizing seascapes and lush gardens everywhere you turn. It’s a perfect natural backdrop for a resort of unsurpassed luxury where everything is included. At six world-class restaurants, a global team of master chefs cater to your endless culinary cravings in stunning settings. Sandals Royal Barbados features several Sandals firsts, from a new rooftop restaurant and bar to two new restaurant concepts including American Tavern and Chi Asian Fusion. Lovers Lanes, Sandals first 4-lane bowling alley, features a colorful backdrop for a romantic evening of couples bowling and Sandals first ever craft beer bar serving 19 different types of beers. From volleyball to bocce ball, Sandals Royal Barbados has exciting land activities and tabletop games such as pool tables and table tennis to enjoy. Plus, our multi-million dollar fitness centers are equipped with state-of-the-art Life Fitness® equipment and complimentary certified instructors. The best way to experience Barbados in full is to get up close and personal with it. Island Routes excursions are led by people born and bred on the island, and they can't wait to share all the best spots and most exciting adventures with you! The all-suite Sandals Royal Barbados features Sandals signature accommodations including Skypool Suites, Millionaire Suites, and Swim-up Suites. At seven world-class restaurants, a global team of master chefs caters to your endless culinary cravings in stunning settings that are on-the-beach casual or white-gloved chic. 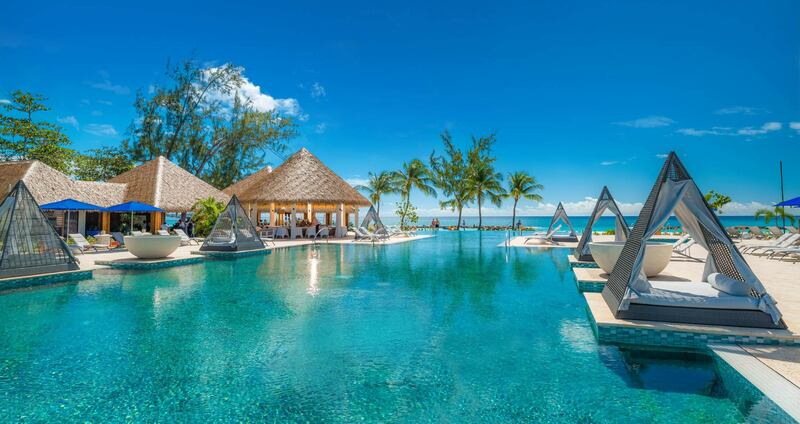 Sandals Royal Barbados features several Sandals firsts, from a new rooftop restaurant and bar to Sandals first gourmet donut shop to two new restaurants concepts including American Tavern serving traditional American cuisine and Chi Asian Fusion, the first Chinese-Japanese fusion restaurant. Choose from up to 18 Restaurants & More! While its rooftop location makes it the perfect place to sunbathe, the surrounding lounge areas and rooftop bar are a great place to relax, cool off and take in the breathtaking vistas. For inclusive offer, the $1000, $775, $505 & $375 Instant Credit are in USD, applied to the base fare and excludes government taxes and fees, which must be paid at time of booking and is fully non-refundable. Save up to 65% off rack rates when you book a minimum of 3+ nights in this room category. For travel now - Dec. 26, 2018 | Jan. 1 - Dec. 26, 2019. For travel: Dec. 27 - 31, 2018 | Dec. 27 - 31, 2019.